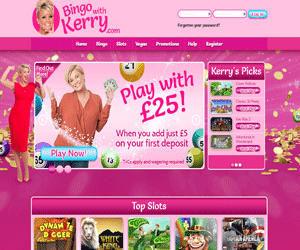 Bingo With Kerry | Play with up £25 Today! Now you can join the fun, enjoy the gossip and win big with the friendliest new bingo site for 2016, Bingo With Kerry! Since her early Atomic Kitten days, singer and media personality Kerry Katona has stolen the headlines for a her personal life, fitness and her ever-changing media career! Kerry is a household name and has now taken her fame and fortune to a new direction with the glam launch of the new Bingo With Kerry site! Fronted by Kerry Katona herself, you can enter Kerry's hot pink and star-studded world of bingo fun! The pink-themed site is filled with glittery gold coins and game balls and powered by the Playtech and Virtue Fusion software and is owned by 8 Ball Games. Once you register and join the fab new site, you'll receive super-fun bonuses and rewards and have to chance to cruise through Kerry's fun-filled bingo beauty and party rooms, plus Vegas games and more! When you step into Kerry's hot pink world, and register, Kerry will personally let you have your first game on her with a £1 free play bonus! Then if you top up your account with just £5 then you can receive a 400% bonus to play with £25. You can then expect a wealth of super-fun and party-themed bonuses and promotions, from the £20K Prize night and £250 Party Weekend, Bingo Linx, Bogof Bingo, Refer a Friend bonus, Jackpot games and more! Kerry has added some personal touches to her collection of branded 90 ball and 75 ball bingo room. As you might expect, you can get fit in the Workout Wonder room, reminisce in the Born in the 80s room, chill out in the Beauty Pad, party in the Reunited 90 ball and Party room, and hang out in Kerry's room and her hide-away room. Next up you can hit the slots lobby to play fab games like Rainbow Riches, Clover Rollover, Adventures in Wonderland, Plenty O' Fortune. You can then play blockbusting hits in the Vegas room, like the Fantastic Four, iconic Marilyn Monroe game, Iron Man 2, Thor and interactive games like Deal or No Deal Multi-ball games and Jackpot games. Kerry also offers a super-fun and buzzing chat community where you can hang out, meet the other roomies, have a gossip and play chat games to win even more glam prizes!